Leading food and wine expert Anthony Dias Blue hosts the Blue Cabo Food, Wine & Tequila Getaway at Marquis Los Cabos from Dec. 11-14, 2008. A Michelin-pedigreed French chef. A James Beard Award-winning wine expert. A revered "Maestro Tequilero" from Tequila City. 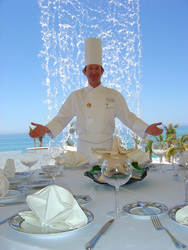 An acclaimed Cabo chef whose authentic Mexican cuisine is enjoyed by presidents and heads of state. It's all on the menu at Marquis Los Cabos' "Blue Cabo Food, Wine & Tequila Getaway," hosted by leading food and wine expert Anthony Dias Blue, from Thursday, December 11 to Sunday, December 14, 2008. The 4 day/3 night "Blue Cabo" is $495 per night, per person, and includes suite accommodations at Marquis Los Cabos, breakfast daily, one massage per person, roundtrip airport/hotel transportation, and four singular dining experiences. For Cabo hotel reservations, visit http://www.marquisloscabos.com or call 877-238-9399 for reservations. The "Blue Cabo" getaway celebrates Mexico's prestige as a gastronomic destination, as well as the food and wine landscape of Los Cabos, where top international chefs fuse their talents with regional Mexican culinary traditions. "Our 'Blue Cabo' event signifies Mexico's growing importance as a destination for culinary tourism, a trend which we are proud to help steer, and which we believe is here to stay," said Marquis Los Cabos General Manager Ella Messerli. Accompanying Anthony Dias Blue are culinary stars including Chef Thierry Dufour of Marquis Los Cabos; Don Emiliano's Chef Margarita Salinas, official gala chef for the Mexican government who travels the world preparing gourmet Mexican fare for heads of state; and Dr. Jaime A. Villalobos Diaz, founder of The Mexican Academy of Tequila-Mezcal-Wine Tasters and known throughout Mexico as "Mr. Tequila." The rare tequilas presented by Dr. Villalobos will instill in guests a true tequila connoisseurship. Wines poured throughout the "Blue Cabo" weekend are personally selected by Anthony Dias Blue, whose extraordinary palate and experience earns his position as editor-in-chief of The Tasting Panel magazine, executive director of the prestigious San Francisco International Wine Competition, and host of the "Blue Lifestyle Minute" radio program on WCBS New York and KFWB Los Angeles. Wine pairing dinner at Marquis Los Cabos' five-star Canto del Mar featuring Chef Thierry Dufour and European wines specially selected by Anthony Dias Blue. Dinner at Chef Margarita Salinas' Don Emiliano in San Jose del Cabo featuring wines from Ensenada. Tequila seminar and dinner with Anthony Dias Blue and Mexico's "ambassador of tequila," Dr. Jaime Villalobos. Dinner of Chef Dufour's specially-created canapés to accompany tequilas. Ceviche yacht cruise aboard a wooden Turkish schooner, sailing by El Arco, a natural rock arch home to a large family of seals in the Sea of Cortez.